To encourage the keeping of cichlids in the hobby it is desired to promote the captive propagation of cichlid species by hobbyists. Captive propagation by hobbyists ensures a consistent supply of many hard to find species in the commercial trade. Fish also tend to be healthier and with less chance of hybridization than commercially pro-duced fish. In addition, the trade in captive raised fish can help conserve wild populations of cichlids. The harvest of some species of cichlids for the trade may be unsustainable to their long term survival in the wild. 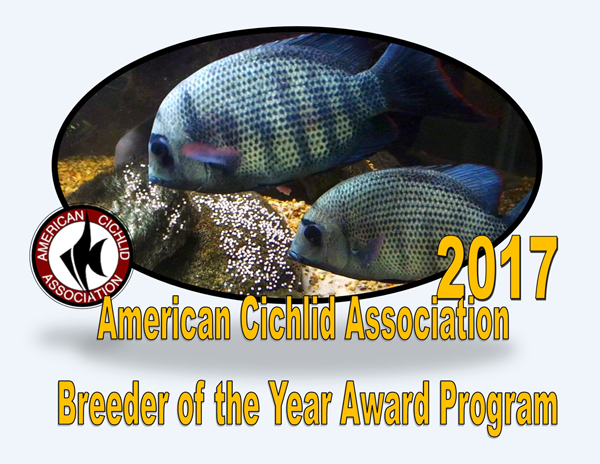 To encourage captive propagation of cichlids, the ACA offers the Breeder of the Year Program. This program awards individual hobbyists who breed cichlids and provide bragging rights to clubs whose members breed the most cichlids. The American Cichlid Association (ACA) wishes to recognize hobbyists who are actively keeping and breeding cichlids. This program works in cooperation with local and regional aquarium societies. The ACA will recognize individual achievements in breeding cichlids, award an ACA Cichlid Breeder of the Year from all entrants, and rec-ognize the local and regional aquarium societies whose members are collectively breeding many cichlid species. This document will spell out the rules of the competition as well as provide instructions to clubs wishing to submit entries. Turned in at least one cichlid species in 2016. Form for clubs to submit Breeder of the Year Program data. Contact representative of Breeder of the Year Program. Open the spreadsheet in Microsoft Excel. Type the name of the breeder in column A, last name first followed by their first name. Type the genus name of the fish spawned in column B. Type the name of the species in column C. Use ‘sp.’ if the fish spawned is an undescribed species. Type the morph, color form, subspecies or locality in column D.
Save the spreadsheet in a file named using this template: ACA_beeder_entry_name_of_your_club (For example: ACA_breeder_entry_Milwaukee_AS).